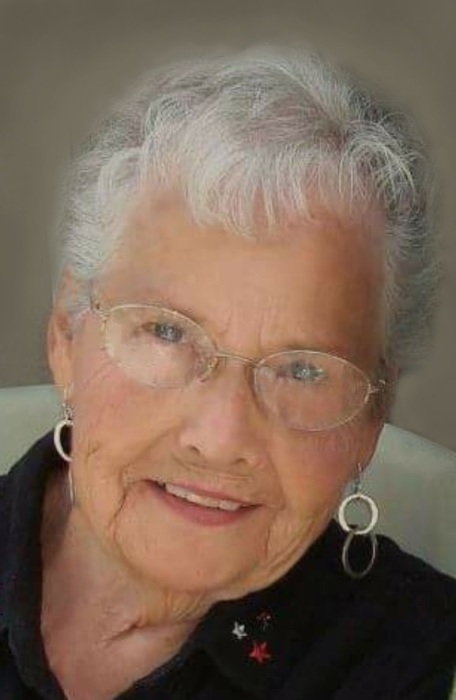 Delores “Dee” Hoseck, age 94 of Winona, died Sunday, January 21, 2018, surrounded by family, at Brookdale Senior Living, Winona. Delores Lucille, the youngest of six children, was born November 26, 1923 in Brookings County, SD to Ole and Irene (Rolfson) Mennis. She graduated from Astoria High School, Astoria, SD. On February 18, 1946 she married Loyel “Bud” Hoseck at Toronto, SD. Bud’s employment brought the family to Winona in 1961. After attending the vocational technical college in Winona for office administration, Dee was employed by Winona Public Schools, 861 as a secretary at Washington-Kosciusko Elementary School for many years, as well as other school facilities. Dee was a member of Central Lutheran Church, Winona. She was active with the Central Lutheran quilters group, and especially enjoyed working on baby quilts presented at each baptism. Dee was an avid gardener, she loved her flowers and ferns and birds. She will be remembered for her smile and laughter. Survivors are her children: Bruce (Diane) Hoseck, Winona; Pam (Michael) Strong, Charlotte, NC; and Debbi (Todd) Spencer, Mankato, MN; five grandchildren: Tom, Keri (Aaron), Matt (Brooke), Jackie, and Stephanie; 13 great grandchildren: Owen, Margo, Bruce, Gavin, Owen, Hayden, Michael, Riley, Brennen, Alivia, Logan, Devin, and Madden and many other relatives. Dee is preceded in death by her parents; husband; a daughter at birth, Carmen; three sisters: Cecil Lane, Erma Distad, and Avis Hicks; and two brothers: Irvie Mennis and Raymond Mennis. The family will receive friends from 5 to 7 p.m. on Friday February 9 at Fawcett Junker Funeral Home, Winona. Memorial services will be held 11 a.m. Saturday, February 10, 2018 at Central Lutheran Church, Winona with Rev. Jeff Franko and Rev. Jan Mehlhoff officiating. Placement in the niche will be at Woodlawn Cemetery, Winona. Visitation will begin at 10 a.m. Saturday at the church. Memorials may be directed to: Central Lutheran Church; Cedar Valley Church or Home and Community Options, all of Winona. The family would like to extend a special thank you to the following people: Mabel Christensen, dedicated caretaker, who brought Dee hours of joy and laughter, neighbors extraordinaire, Bob and Sandy, who provided years of friendship and assistance, and the caring staffs at Winona Health, Saint Anne of Winona, Brookdale Senior Living and Winona Area Hospice. Services have been entrusted to Fawcett Junker Funeral Home and Crematory, Winona, MN and Fountain City, WI. Words of sympathy or remembrance may be left at www.fawcett-junkerfuneralhome.com.